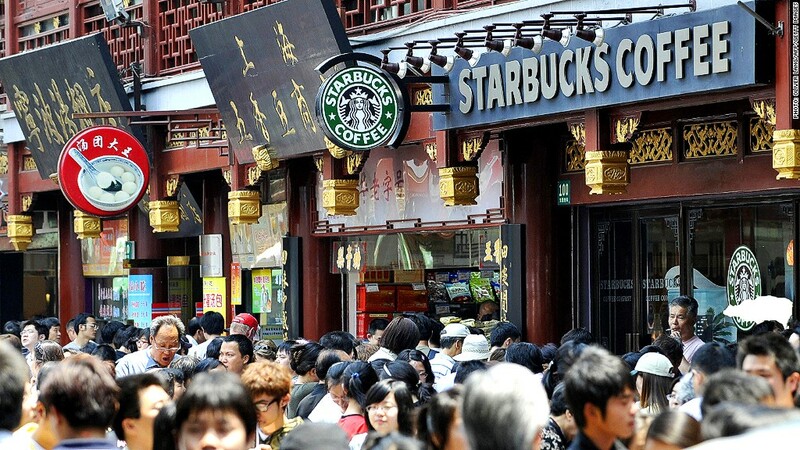 Starbucks has been accused of charging more for coffee in China than in other countries. Starbucks is under fire in China over how much it charges for coffee as a wave of criticism of Western companies' business practice continues. Separate reports from state-backed China Central Television and the China Daily newspaper in the past week have accused the company of making consumers pay more for its coffee and related products in China than in other markets, including the United States. The CCTV report said a medium size latte costs 27 yuan or $4.40 in China, compared with $3.20 in Chicago and about $4 in London. The reports also said a Starbucks coffee mug - which is made in China - sells for between $10 and $14 in the U.S., and as much as $18 in China. Starbucks (SBUX) was not immediately available for comment. The Seattle-based coffee chain is doing well in China. Strong sales contributed to a 30% year-on-year jump in revenues from its Asia-Pacific region, according to a report published in July. The heat on Starbucks pricing in China comes as local authorities step up the pressure on international companies. The country's state media launched an aggressive campaign against Apple (AAPL)in March, after CCTV broadcast an expose on the tech firm's warranty standards and customer service in China. CCTV reported that Apple was using refurbished parts to repair products in China, and limiting some warranties to one year. At the same time, a series of investigations into price fixing and anti-competitive conduct targeted U.S. and other global companies. A powerful state agency in China announced record fines against five international dairy firms in August after they were accused of fixing the prices of baby formula. Mead Johnson, Abbott Laboratories (ABT) and France's Danone (DANOY) were among those slugged with penalties. Pharmaceutical companies are also being probed as part of a wider anti-corruption crackdown in China. Chinese regulators are investigating production costs and price setting practices at 60 pharmaceutical companies, including GlaxoSmithKline (GLAXF), Astellas (ALPMF) and Sandoz.